? Tax based on United States. The "No One Fights Alone!" Cancer Greeting Card is one of six different designs with outside and inside messages to share with a family member, friend, coworker, and/or anyone facing (or have faced) a journey with breast cancer (or any other cancer). 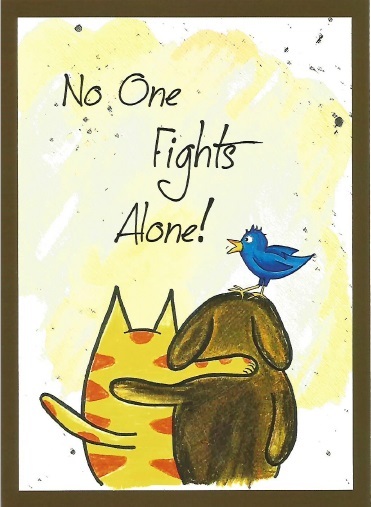 The card was especially designed to provide inspiration, support, and a bit of humor for anyone facing a journey with cancer such as receiving a cancer diagnosis; going through radiation; taking chemotherapy; undergoing surgery and other related challenges. The cancer greeting card measures 5 inches x 7 inches. It has a special message on the front and inside with space for a personalized message from you. It is standard size card requiring a regular postal stamp. It comes packaged with a high-quality white envelope in a crystalline bag. Front message: No One Fights Alone! 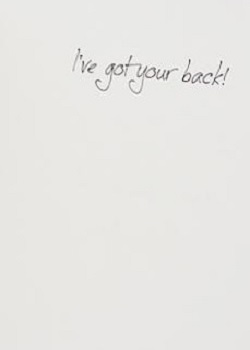 Inside message: I've got your back! "I'll Stand By You" Gre..
"I will always support ..